A wider view of the rock with Madara Rider. The Madara Rider or Madara Horseman (Bulgarian: Мадарски конник, Madarski konnik) is an early medieval large rock relief carved on the Madara Plateau east of Shumen in northeastern Bulgaria, near the village of Madara. The monument is dated in the very late 7th, or more often very early 8th century, during the reign of Bulgar Khan Tervel. In 1979 became enlisted on the UNESCO World Heritage List. The relief depicts a majestic horseman 23 m (75 ft) above ground level in an almost vertical 100 m (328 ft)-high cliff. It is of almost natural size. The horseman, facing right, is thrusting a spear into a lion lying at his horse's feet, and on the left a dog is running after the horseman. The carving of the horseman's halo and garments, as well as the bird in front of the horseman's face, are barely recognizable due to the erosion and bad condition of the monument. The relief is similar to the carbon images found in Saltovo, Soulek, Pliska and Veliki Preslav. The meaning and symbolism of the depiction is uncertain, as well its actual masonry tradition and cultural source. In the scholarship the origin of the relief is connected with the Bulgars ethnogenesis – the semi-nomadic equestrian warrior culture from the Eurasian Steppe. Others saw in the relief resemblance to the Sasanian rock relief tradition. The hero-horseman is a common character of Turkic and Iranian-Alanic mythology. It is sometime considered that the horseman represents or is related to the Bulgar deity Tangra, while Vladimir Toporov related it to the Iranian deity Mithra. Others noted a more simple explanation – that the relief represented Khan Tervel (701–718 AD), or like previously considered and now rejected, Khan Krum (802–814 AD). Some considered it an example of the Thracian horseman – a recurring motif of a deity in the form of a horseman in the Paleo-Balkanic mythology. The motif typically features a caped horseman astride a steed, with a spear poised in his right hand. He is often depicted as slaying a beast with a spear, although this feature is sometime absent. Initially considered (and later abandoned) by Konstantin Josef Jireček and Karel Škorpil, the assumption was gradually rejected because of differences in the iconographic details, and the relation with the animals (there's no dog). The relief probably incorporates both autochthonous Thracian and the newly arrived Bulgars cultural cults. The monumental size, iconography and the details (stirrup, halo, skull-cup, bird etc.) is generally part of the Bulgar tradition, while the rightward direction and the lion of the Thracian tradition. In the 1924–35, beneath the relief (some 250 m north) were found the remnants of a complex which is considered to have been a pagan shrine (three-aisled church) and a rectangular building, probably the ruler's private dwelling, where the ruler did sacral rituals related to Tangra. At the site was also found a damaged inscription by Khan Omurtag which mentions the deity Tangra. The complex is commonly dated to the second quarter of the ninth century, as the 1970s excavations dated the pottery between 8th and 10th century. Some argue that the earliest buildings were founded after the conversion to Christianity. Thus the pagan temple (i.e. church) and the building would have been built on an early Byzantine basilica. To the west of the building was found Christian burial, with golden decorated belt, dated c. 900 AD. Throughout the 20th century, two miles (c. 3.2 km) northeast from the relief was found another group of buildings, consisting of 5th-6th century basilica, with inner rectangular structure, which some interpreted as the pagan temple (but without clear evidence). Three partially preserved texts in Medieval Greek, carved in the rock, can be found around the image of the rider. They bear important information regarding the history of Bulgaria in the period. The oldest inscription is the work of Tervel (701–718 AD), thus it is considered that the relief was created during his rule or immediately after the Bulgars settled in 680–681 AD. The other inscriptions refer to the Khans Krum (802–814 AD) and Omurtag (814–831 AD) who are most likely the ones who ordered the carvings. Justinian the emperor made a treaty [...] the Bulgars [...] and came to Tervel. My uncles at Thessaloniki did not trust the emperor with the cut-off nose and went back to the Kisiniie [...] one of his [...] The ruler Tervel made a treaty and gave to the emperor five thousand [...] with my help the emperor scored a fine victory. The Madara Rider is depicted on the obverse of smaller Bulgarian coins (1 to 50 stotinki) issued in 1999 and 2000. A June 29, 2008, official survey on the design of Bulgaria's future euro coins was won by the Madara Horseman with 25.44 percent of the votes. Madara Peak on Livingston Island in the South Shetland Islands, Antarctica is named after the historic site of Madara. ^ a b c d Donchev 1981, p. 41. ^ a b c d Petkov 2008, p. 5. ^ a b c d e Fiedler 2008, p. 202. ^ Donchev 1981, p. 46. ^ a b c d e Sophoulis 2011, p. 83. ^ Donchev 1981, p. 41, 45–46. ^ Donchev 1981, p. 41–42. ^ Fiedler 2008, p. 204. ^ a b Stancheva, Magdalina; Totyu Totev (1996). The Madara Horseman. Antos. Archived from the original on 20 June 2006. ^ a b Donchev 1981, p. 43. ^ a b Boteva, Dilyana. "Combat against a lion on the votive plaques of the Thracian Rider (a database analysis)". Thracia. XVI. pp. 213, 216, 218. ^ Donchev 1981, p. 43–44. ^ Fiedler 2008, p. 204–206. ^ Sophoulis 2011, p. 83–85. ^ Fiedler 2008, p. 207. ^ Sophoulis 2011, p. 84–85. ^ Sophoulis 2011, p. 291. ^ a b Fiedler 2008, p. 205. ^ a b Fiedler 2008, p. 206. ^ Fiedler 2008, p. 205–206. ^ Petkov 2008, p. 5, 11. ^ Petkov 2008, p. 6. ^ Bulgarian National Bank. Notes and Coins in Circulation: 1999: 1 stotinka, 2 stotinki, 5 stotinki, 10 stotinki, 20 stotinki, 50 stotinki; 2000: 1 stotinka, 2 stotinki & 5 stotinki. – Retrieved on 26 March 2009. ^ "Bulgaria selected the new eruo design". Info Bulgaria. Archived from the original on 2008-06-20. Retrieved 2008-06-30. ^ "Bulgaria Chooses Madara Horseman for National Symbol at Euro Coin Design". Sofia News Agency Novinite. Retrieved 2008-07-01. 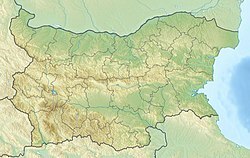 ^ "Bulgaria chooses heritage site to adorn euro coins". EU Business. Archived from the original on November 19, 2008. Retrieved 2008-07-01. Donchev, Slavi (1981). The Madara Horseman (PDF). 23–24. ICOMOS. pp. 41–46. Vesselin Beschevliev, "Les inscriptions du relief de Madara", Bsl, 16, 1955, p. 212–254 (Medieval Greek, French). Vesselin Beschevliev, "Die protobulgarischen Inschriften", Berlin, 1963 (Medieval Greek, German). Веселин Бешевлиев, "Първобългарски надписи", Издателство на Българската академия на науките, София, 1979 (Medieval Greek, Bulgarian). Wikimedia Commons has media related to Madara Rider.